From my perspective as a master fitness professional, one of the biggest challenges people struggle with is a lack of belief. Those desiring weight loss especially tend to lack the belief that they can make the lifestyle changes needed and then stay on track long enough to reach their goals. As a trainer, it is my responsibility to fill in the gaps where necessary and filling the belief gap is critical if clients are to ultimately take enough action to get sufficient results to start believing in themselves. The following little analogy is from world renown leadership expert and my long-time mentor John Maxwell. Here’s the set up. 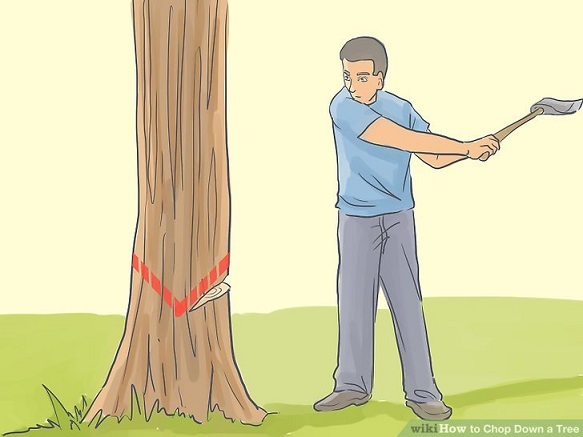 You have a large tree in your back yard and I give you a brand new bright and shiny axe along with simple instructions. Your task is to take 5 swings a day at the tree. I’m not asking you to spend hours at a time…just 5 swings…every day. My question is, will the tree fall? Almost without hesitation, the answer that even my most extreme weight loss clients give is “yes”. Bingo! The answer is so obvious that regardless of how little belief the person has in themselves, they readily and logically feel that they can tackle the task of falling the tree…if they just persist long enough. As soon as I get this answer, I immediately turn it back to them and reassure them that if they will treat their fitness goals the same way, their “tree” will fall as well. There is tremendous power in consistent small steps taken daily in pursuing any goal. Another question I ask is “what happens when you double a penny every day for 31 days?” Most have no clue so they are shocked and usually a little disbelieving when I give them the answer. Do you know? The answer is $10,737,418.24. Now here’s the catch. The math is the same from day 1 to 2 just like from day 30 to 31 and it never changes. It’s just simple duplication. From day 1 to 2 you go from $.01 to $.02. 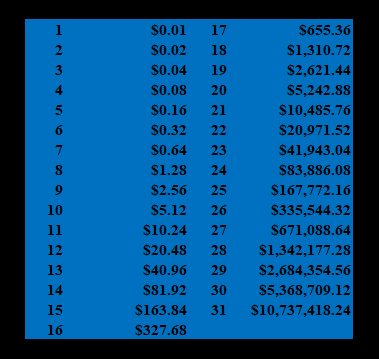 From day 30 to 31, you go from $5,368,709.12 to $10,737,418.24. Again, the math never changes…the key is the daily action taken. I teach my clients that their consistent efforts compounded over time will allow baby steps to add up to incredible and life changing results. It doesn’t take huge extraordinary leaps of faith or action at any point. Just take small, faithful, little steps…daily, and you can accomplish even the most seemingly impossible goals…including weight loss or whatever your goal may be. Jerry Seinfeld was once asked by an interviewer the secret to his success. He gave credit to his wall calendar. Confused, the interviewer asked for further explanation. Jerry said in his early years with the television show Seinfeld, he set a goal to write every day. Some days he wrote “crap” and some days “gold”. Regardless of the outcome, if he completed his daily writing, he put a big check mark on his calendar for the day. It became a game after some time where he had such a string of “X’s” going that there was no way he was going to break it. The daily victory of being able to check off the calendar played a big role in his success helping to produce one of the most popular sitcoms ever. Whatever you’re striving for, break it down to the most simple daily tasks. And it really must be simple. Best selling author Jim Collins said in “Good to Great” that if you’re pursuing more than 3 goals at any one time, then you’re just spinning your wheels. You may have many goals overall, but you must discipline yourself to focus your energies on only a select few and then really give them your complete focus. 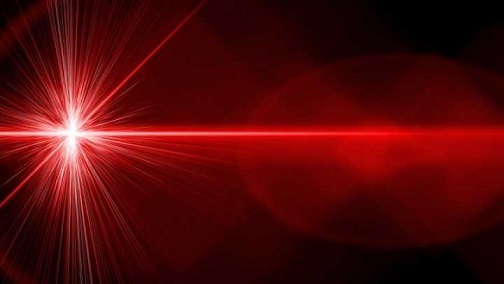 The sun shining down is simply warm but focus the light through the right type of lens and it will produce a laser that will cut through steel. This is the kind of focus you need to accomplish your biggest goals. And remember, it doesn’t need to be complicated. In our penny example above, the action was simple daily duplication. The key is to take consistent action over the long haul which will yield incredible results. This entry was posted in attitude, Faith, goal setting, Health & Fitness, John Maxwell, leadership, life path, Nutrition, personal development, self talk, success, Uncategorized, weight training and tagged #diet #health #fitness #wellness, attitude, Faith, goal setting, John Maxwell, leadership, personal development, success. Bookmark the permalink. 1 Response to Swing the Axe! Well said, my friend and trainer!